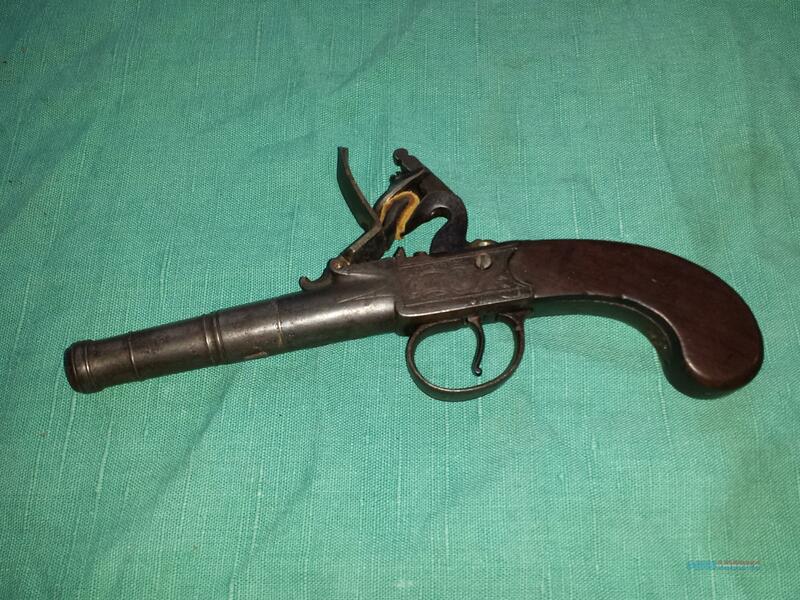 FLINTLOCK PIRATE PISTOL .60 CAL. Description: An early Queen Anne Flintlock pistol with a 4" tapered barrel, and clear under barrel proofs of a crown over CP and crown over V. The action works well when the hammer is pulled back and the trigger is released, This gun gets a shower of sparks.The exterior metal is dark but not pitted of sanded down. The English walnut stock is very good, with no splits or cracks.Frame is chisel engraved on both sides and the top and bottom tang. The gun measures about 8" over all and these guns were used by spies during the Rev. War! My description is the gun you get, not very often do I miss something, I tell you all I see. When buying a gun always have it examined by a competent gunsmith before shooting.To buy a gun from me you must get a direct email for me, with details, and shipping cost. We don’t have a web site .I prefer money orders or a check. Item ships when funds come in. If you can only pay with a card let me know. I’m sorry I don’t list my phone number, did that for 30 days, never again.. I can’t talk on the phone all day…who will ship the guns? I’m just one person, and it’s very busy here! I do a brisk volume! I hope you like my wide selection of unusual guns, knives and gun parts. Shipping price determined by zip code. I try to keep the prices affordable, which means I make less money than most dealers. You won’t get altitude sickness with my prices! I consistently have the best selection of older guns If you attempt to buy, you must still contact us for details, buying doesn't end the sale, it just sends an email telling us you want to buy this gun. A phone call won’t secure a sale! Not home many times, the first buyer by email buys the gun !This web site does not close down a sale when you do a BUY! I can get six buys in an hour, first buyer to email gets the guns, others are in second place! Best to send another email . Sometimes not home to get calls. Some guns are required shipment to a gun dealer near you for a transfer to you when it arrives. With the widest selection of older guns at great prices, We don’t have a store, and sell on the internet only. Thank You.